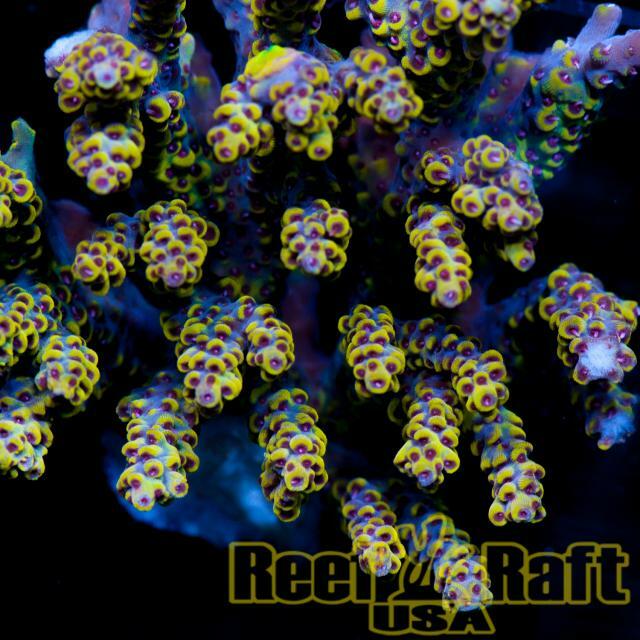 We sure do love our colored sticks, and Reef Raft USA has one that is particularly beautiful. 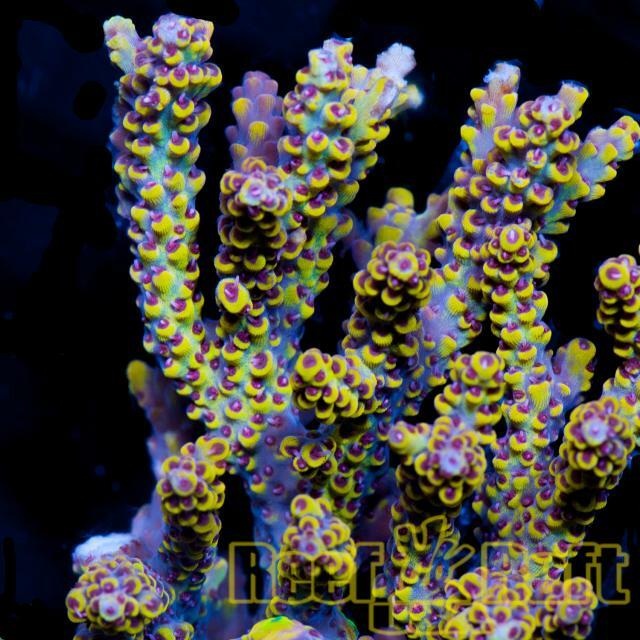 Recently displayed on the Reef2Reef forums, the stunning D-Day Acropora sports an exotic combination of colors, including a blue base, neon yellow corallites, dark red polyps, and hints of green laced throughout. It’s a beautiful coral to say the least, and although it sports a pretty exotic price tag, it’s a coral that is high up on our list of favorites among the Acroporids. The D-Day Acro sports a striking resemblance to the TCK Pikachu Acro that we shared back in April, though that electrifying Acro was far more monochromatic, consisting of bright yellow tissues with red polyps. It lacked the blue and green that makes the D-Day a standout coral, though we wouldn’t be surprised if they turned out to be the exact same coral that has taken on a slightly different appearance due to lighting or some other external factor. The price for Reef Raft’s D-Day is set at $400 per 1/2″ – 1″ frag and a total of five will be made available, at least initially. its discusting how companies are driving up prices on coral just because they have an eye catching piece. Its just going to ruin the industry!!!! Ashamed they are trying to cashing in on D-Day for the name. It can’t be easy making money with corals. I have no problem with the prices. I won’t pay that until the price comes down but certainly don’t blame them. If you can’t afford a Ferrari, not much point walking around through life whining about the price of Ferraris. To go through the trouble of finding a supplier, importing the corals(with fees mind you ) Not knowing what the colors will be after allotting space /time in a tank to see if it will become something special, waiting and all the other things associated simply cost money. I seriously doubt RR is getting rich off of these corals. Just be happy that someone is going through the effort and eventually you’ll be able to get one as it gets cheaper down the road.